Treat Dispensing Fun! Biscuit Ball is a unique patented ball with a hollow center and four bone-shaped ports to hold all varieties of dog bones, food and treats. 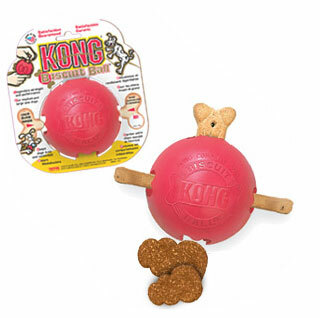 It is fun, extraordinarily durable, and keeps dogs contentedly busy playing and/or removing the tasty morsels.Kong Stuff N treats and pastes work great to initiate play sessions. Kong - Biscuit Ball - Small product is categorised under Wholesale Kong Company, WA products, Wholesale Dog Products, Wholesale Toys, Wholesale Balls.